National Security Advisor H.R McMaster has been in the news a great deal this week as he continues his purge of Trump loyalists. Now there are reports McMaster might be shipped off to Afghanistan to oversee the war. 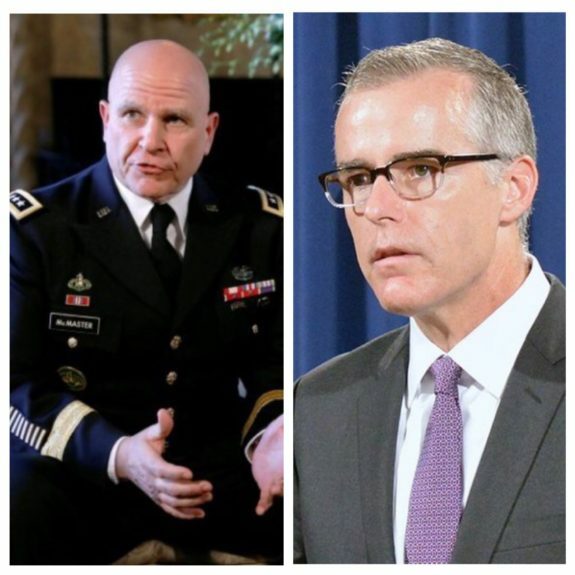 The news also comes amid reports McMaster was caught leaking internal White House politics to now former Acting FBI Head Andy McCabe. Trump has reportedly expressed frustration with Gen. John Nicholson Jr., the top U.S. general in Afghanistan, because the U.S. and its allies are not “winning” the war there. In a Saturday afternoon tweet, Circa News’ Sara Carter revealed President Trump is mulling another major White House shake-up, which would see National Security Advisor H.R. McMaster replaced by CIA Director Mike Pompeo. “Investigating: Rumors swirling in Wash circles and sources saying @realDonaldTrump “considering CIA Pompeo to replace HR” wait and see?”, tweeted Carter. As The Gateway Pundit previously reported, Sara Carter of Circa News said her sources told her that NatSec Advisor, H.R. McMaster has been communicating White House internal politics to Deep State Acting FBI Director Andy McCabe. Carter then implied that more White House shake-ups are perhaps on the horizon.